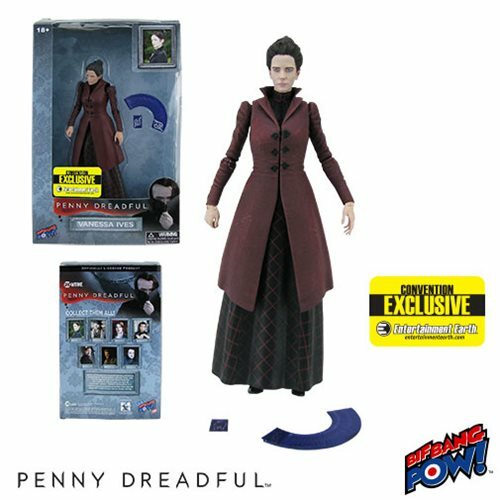 First-ever 6” inch action figures from Penny Dreadful! Includes the mysterious heroine’s set of fanned tarot cards (1 piece) in addition to a single tarot card. Entertainment Earth Convention Exclusive! As seductive as she is formidable, Vanessa Ives is a complex mixture of mystery and supernatural mojo. Now collectors can add the enigmatic medium to their collection with the Penny Dreadful Vanessa Ives 6-Inch Action Figure from Bif Bang Pow!. The intricately detailed figure showcases the beautiful clairvoyant in a an ankle long black skirt with a checker square pattern along with a matching maroon vintage Victorian coat which is made of soft and bendable PVC plastic. The rest of Vanessa’s wardrobe is completed by a black turtleneck-esque undergarment. This first ever 6-inch figure of the popular Penny Dreadful character features a whopping 18 points of articulation and includes Vanessa’s trusty set of tarot cards fanned out into one piece along with a separate single card. With a production run of only 3,700 pieces, collectors will want to grab this individually numbered and limited edition Entertainment Earth convention exclusive before it mysteriously disappears! Ages 14 and up.